Sanlorenzo bring SX88 yacht to boot Düsseldorf. Sanlorenzo inaugurated the 2019 New Year by taking part in the 50th edition of Boot Düsseldorf, from 19 to the 27 January. 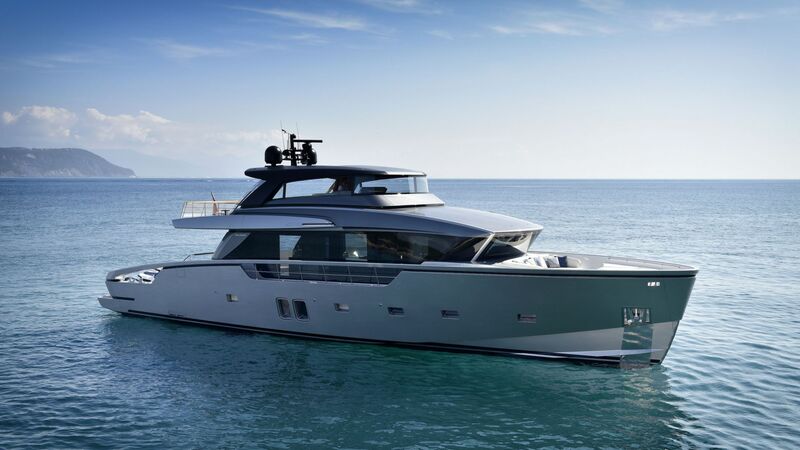 On display the crossover SX88 yacht, selected to represent Sanlorenzo’s style. The SX88 is a highly innovative proposal, full of original and clever, rational and practical features and the company has already sold about 20 units of this model. A successful and clever union between classic flying bridge motoryachts and the explorer type yacht, the SX88 contains various firsts by Sanlorenzo. The availability of large open spaces and large windows ensure optimal interior to exterior access, a feature increasingly requested by the most experienced and knowledgeable owners. The hull has a very seaworthy high bow, and maintains the profile descending towards the stern that slims the whole mass and gives it a substantial appearance. The superstructure, featuring ample glazed surfaces, harmoniously integrates the voids of the windows into the full areas of the structure. The wheelhouse located on the upper deck, the flying bridge, has a windshield and if necessary can be enclosed sideways by double-hung windows, while the whole stern area of ​​the bridge can be enclosed by a series of strataglass panels. The wheelhouse placed only on the fly, frees up the living room area at the bow on the main deck, which can be dedicated to the dining room adjacent to the kitchen or, as in the version designed by Piero Lissoni, the main deck interior becomes a single open environment which houses as a continuous living area, the living room, dining room and open kitchen. The bow area of the main deck is fully equipped to offer a livable, convivial, and relaxing area with a large sunbed, convertible into a very private and shaded dining area. The swimming platform at the stern, four steps lower compared to the main deck, houses the tender, a jet-ski and other toys. Hidden in the profile of the extension of the left handrail, is the crane to move the two toys without cluttering the area with technical gear. Once freed from the tender, the vast platform, which extends about 50 centimetres on the water surface, becomes an extraordinary beach club of over 30-square-metres, furnished with sun umbrellas and sunlounges.